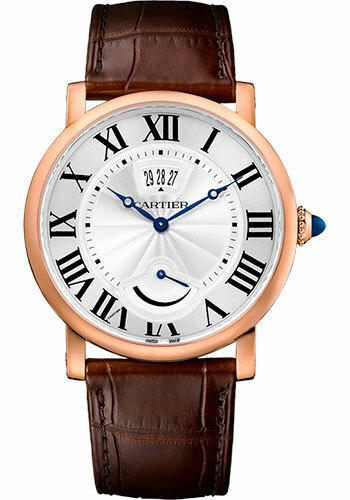 40mm 18K pink gold case, 8.94mm thick, sapphire back, fluted crown with a cabochon sapphire, 18K pink gold bezel, sapphire crystal, silver dial set with calendar aperture at 12 o'clock, caliber 9753 MC manual-winding movement with apple-shaped hands in blued steel, brown alligator skin strap, folding buckle. Water resistant to 3 bar. 40mm 18K white gold case, 8.94mm thick, sapphire back, fluted crown with a cabochon sapphire, 18K white gold bezel, sapphire crystal, gray dial set with calendar aperture at 12 o'clock, caliber 9753 MC manual-winding movement with apple-shaped hands in blued steel, gray alligator skin strap, folding buckle. Water resistant to 3 bar. 40mm steel case, 8.94mm thick, sapphire back, fluted crown with a synthetic cabochon-shaped spinel, silvered guilloché, steel bezel, sapphire crystal, silver dial set with apple-shaped hands in blued steel, caliber 9348 MC manual-winding movement with calendar aperture at 12 o'clock, apple-shaped hands in blued steel, black alligator skin strap, folding buckle. Water resistant to 3 bar.